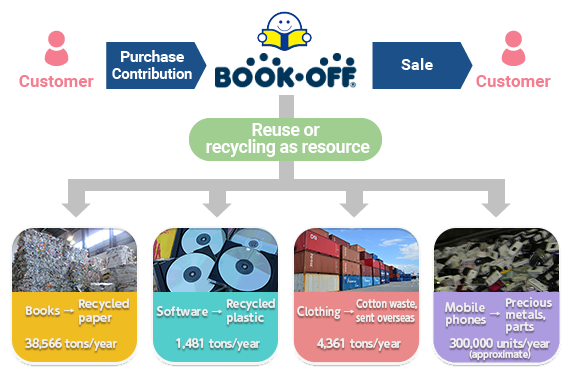 Books, software, clothing, and mobile phones that can no longer be used are given to an outside company with which we cooperate to have the items reused or recycled as resources. To reduce the use of plastic shopping bags, BOOKOFF stores ask customers if they require a bag when they make a purchase. BOOKOFF’s plastic shopping bags are harmless. These shopping bags are made of harmless polyethylene. They do not emit hydrogen chloride or other harmful substances when incinerated. Stores and offices are implementing joint initiatives to reduce energy consumption by regularly cleaning air conditioning filters, and to introduce paperless operations by shifting to electronic internal reports. BOOKOFF submits and publicly releases a Carbon Reduction Report as required under the Carbon Reduction Reporting Program as per the Tokyo Metropolitan Government’s Ordinance Concerning the Environment to Ensure Tokyo Citizens' Health and Safety.